different view of this woman. I'll give my comments and reasons after I present Lois Roden's words. Everlasting Father." 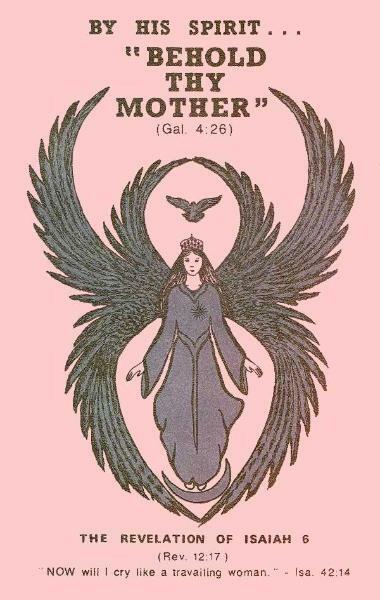 (Lois Roden, "Behold Thy Mother," Part 3, 1980, p. 30). State of Germany officially recognized the work of the Reformation in 1555." was instrumental in gaining state recognition for the Reformation in Scotland in 1560." makes it known." 1 S.R 127-128." indication of recognition for a Reformation in our day." Revelation 12."" (Ibid, "The Merkabah," Part 3, 1984, p. 29,30). In 1985, Lois Roden herself began an attempt to reform the Christian church with her message. U.S.A. and to the Mother Church (to prepare the way for the Kings of the East) in the Far East (by request). earthly advent of the Holy Ghost. Here is Lois discussing the fourfold Holy Family from the creation. TWO Adams – male and female made in the image of at least two Persons called "God." Lois Roden also discussed the Holy Ghost as she was symbolized during the crucifixion. out. That the Scripture (Zec. 12:10) might be fulfilled..." John 19:34-36." Ghost, His Bride."" (Ibid, p. 7). Lois Roden also taught the Holy Family from Zechariah 4. ANOINTED ONES that stand BY the Lord of the whole earth." Zec. 4:12,14." the office of the Spirit (Feminine) of Prophecy, the Writings of the prophets, as given by the Holy Ghost." by a prophet, Moses, with the PROMISE of a Son." God, the Father. (Heb. 1:3,5,6,13)." helpmeet standing by Him (Zec. 4:14) in the creation of all things in Their Image, male and female." ""The sum of all this nature story is:"
the Eternal Father in Heaven; then, the evidence is conclusive:"
Holy Spirit, the Eternal Mother (Zec. 4:14)." ""All these symbols denote TWO SETS of Witnesses in Heaven: (1) The Eternal Father and Eternal Mother. (2) The Everlasting Father (Christ) Isa. 9:6, and the Everlasting Mother (the Holy Ghost – John 14:26). (Holy Ghost)..."" (Ibid, p. 9,10). perfect harmony; a church without guile. Shepherd's Rod, Vol. 2, p. 286. These TWO "Olive Branches"
Her IMAGE, a message of a "likeness of herself" – the HOLY GHOST."" (Ibid, p. 14). Lois Roden also preached the joint rule of Christ and the Holy Ghost in the Kingdom of God. GHOST who intercede for humanity BEFORE the Eternal Throne in Heaven in the Heavenly Sanctuary. Rom. 8:26,34."" (Ibid, p. 18). said unto you." John 14:26." 14:26."" (Ibid, "Christ And The Holy Spirit, Two Turtle Doves," 1978, p. 7). Mother and Daughter if she had lived longer. be fulfilled before the whole earth is the Lord's. I was also given understanding of the parable of the trees (Judges 9:8-15) as it relates to the Holy Family. The parable of the trees underlines the differences between members of the Holy Family. lawgiver, the Lord is our king; He will save us." (Is. 33:22). Her nature to be an intercessor rather than a judge. according to the will of God." (Romans 8:26,27). meek and humble (small) and to turn the other cheek and resist not evil. maketh intercession for us." (Romans 8:34). John 14:26), it is the nature of the pomegranate to be a judge. Ghost shall not be forgiven unto men." (Matt. 12:31). an everlasting kingdom, and all dominions shall serve and obey Him." (Dan. 7:27). saith the Lord, will be unto her a wall of fire round about, and will be the glory in the midst of her." (Zech. in the second series of numbers). made reference to her personal earthly advent. Eve (Holy Ghost)..."" (Ibid, "The Bride Of Christ," 1986, p. 10). Daughter appears as herself, with the wings of a seraphim.